Dunedin is one of New Zealand's undiscovered gems of international fly fishing travel. The largest cosmopolitan city on the lower South Island, Dunedin is an excellent and overlooked base for one- to ten-day fly fishing sojourns, especially if you’re traveling with folks who don’t fish. Home of the nation’s oldest university, Dunedin is a laid-back, compact, green and walkable city with many of the best aspects of Seattle, Missoula, Boulder, or Eugene, Oregon. Here you get both the raw and the cooked. There’s something for everyone: wildlife, art galleries, walking trails, funky cafes, wine bars, ethnic food, live indie music, several of the best museums in the country and a wide range of accommodations. And within a two hour drive, over 20 blue-ribbon wild trout waters that see far fewer anglers than those near more overdeveloped destinations like Queenstown or Wanaka, where the trout can get jaded in the middle of the season. Dunedin is a great base for launching your South Island fly fishing sojourn. 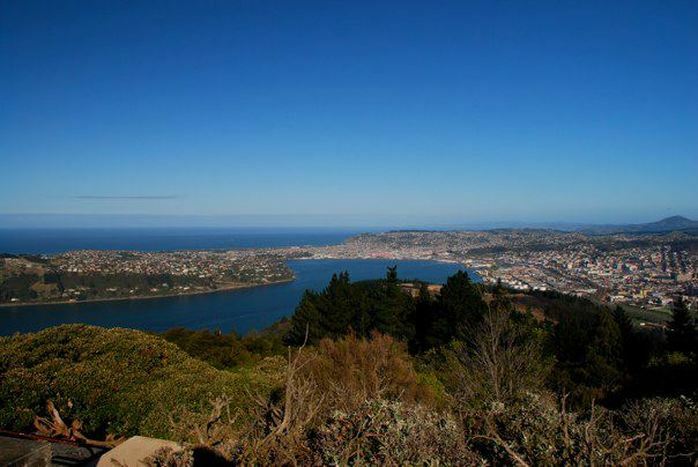 Its landscape is a stunning setting, where the Pacific Ocean meets the Otago Harbor and Peninsula. The latter is home to rare albatross, blue and yellow-eyed penguins and has been suggested as a UNESCO World Heritage site. To the northwest are the wild Silver Peaks, to the north the cloud forest of the Orokuni Ecosanctuary. The Lonely Planet Guide proclaims Dunedin "the South Island's Coolest City," noting it is "surprisingly artsy" with a strong local music scene. This is no backwater burg. The city is full of its own funky charm, from Baldwin Street, officially the world's steepest, to the quirky InchBar, to arthouse cinemas, cool galleries with world-class local art, to the secret urban scenes used for fashion shoots. The Octagon is at the heart of the city, where on a Friday afternoon you might see lounging in a streetside cafes a mix of goth models, retropunks with mohawks or farmers in gumboots. Dunedin is also on the cusp of its own Slow Foods movement, with a "thriving" Farmers' Market where you can buy artisanal cheese and chocolate, crepes, fresh flowers and herbs, regional seafood, free range eggs, heritage potatoes chutney, jam and marmalade or award-winning Otago Pinot Noirs, recently judged the world's finest. Local microbreweries like Emerson serve organic beers and IPAs. The local Fortune is the world's furthest south professional theatre company. Dunedin also recently won a national competition for gigabit internet, a distinction achieved by other global tech centres like San Francisco, Seattle, Austin and Santa Monica. Many consider Dunedin--rather than commercial Auckland or political Wellington-- New Zealand's intellectual capital. Artists like Francis Hodgkins, Colin McCahon, Grahame Sydney and Ralph Hotere launched their careers here. Novelist and Nobel-short-list writer Janet Frame was born in Dunedin. Her autobiography inspired Jane Campion's film, Angel at My Table. One of New Zealand's finest living poets and ardent conservationists, Brian Turner, also grew up here. His poetry recalls Ted Hughes'. But Turner's regular column in New Zealand Fish and Game magazine entertains a different audience. And his wonderful book Into the Wider World passionately conveys the joys of South Island fly fishing landscapes and sadness at its degradation at the hands of unregulated Industrial Dairy. Turner's long-time fishing crony, Dave Witherow, recently published Open Season, a hilarious and near mythical set of angling yarns in the madcap Celtic spirit of Flann O'Brien's At-Swim-Two-Birds. Based in Dunedin, Wild Angler is a high-quality South Island New Zealand fly fishing guide service specializing in one- to ten-day trips to rivers like the legendary Mataura, whose lush Deleatidium hatches and wild free-rising browns make the river a dry-fly mecca; intimate Otago and Southland tributaries with big fish in small water; and classic backcountry rivers of the Southern Alps. Cruiseboat passengers are happy to learn that the area has plenty of fishing within an hour of town. In the past I've also picked up such visitors for longer cruiseboat fly fishing escapes, taken them fishing for three days, then deposited them in Queenstown where they fly out to rejoin their ship at the next port of call. What Dunedin offers that dedicated tourist destinations can't is authentic encounters with unjaded friendly locals, native wild life and scenic beaches and bush walks, more trout per anglers and--because of the university and established art and music scenes--the cultural experience of larger cities. The first gamefish, indeed trout, to be liberated in New Zealand were released here in Dunedin, in 1869, into the Water of Leith, which flows through the Botanic Gardens. Also based in Dunedin is the Otago Anglers Association, the oldest angling club in Australasia. Wild Angler also guides other regional gems that lend themselves to loop trips out of Dunedin. Match-the-hatch fans will relish chasing the yellow-winged Kakahi Queen hatches among the golden kowhai blooms in the Catlins or on the mighty Waiau. The lonely waters of the upper Taeiri and Maniototo beckon travelers searching for a glimpse of undeveloped vistas local writers and artists call "The Timeless Land." And a little further to the north or west, the big-fish rivers of the Central South Island. And if you want a longer road trip, we can add the wild West Coast—a true troutbum’s frontier--then you can depart the country from Queenstown or Christchurch. With non-stop flights to Auckland, Dunedin is a logical point of arrival and departure. Cruiseboat passengers who stop in Dunedin for the day also have many good options an hour or less from town. For the non-angling travel partner, there is so much to do when everyone else is out fly fishing you won't even miss them. Take a short, winding drive to the spectacular Otago Peninsula to see pristine beaches and headlands and the Royal Albatross and blue and yellow-eyed penguins. To the north await day trips to places like Moereki Boulders and the award-winning restaurant, Fleur's. Tour the local Cadbury Chocolate Factory. Take a run or a walk through the numerous greenbelts, walking paths or Botanic Gardens, some of the country's finest. ​ Ecotourism and angling travel couldn't have a better base for discovery. Looking for a Dunedin fly fishing guide? Contact Wild Angler today.